Psychology deals with the most complex subject matter of any science. As such, it is subject to misunderstandings, artifacts, and just simple errors of data, logic, and interpretation. This book teases out the details of some of the sources of these errors. It considers errors in psychological data and theories that arise from confusing endogenous and exogenous causal forces in perceptual research, misinterpreting the effects of inevitable natural laws as psychological phenomena, improper application of statistics and measurement, and flawed assumptions. Examples of each of these sources of error are presented and discussed. Finally, the book concludes that a return to a revitalized kind of behaviorism is preferred, rather than continuing on the current cognitive path. Contents: Preface. Introduction. Endogenous and Exogenous Causal Forces in Perception. Inevitable Natural Laws and Superpowerful Mathematics. Measurement, Counting, Magical Graphs, and Some Statistical Curiosities. Erroneous Assumptions and Conceptual Errors. Final Conclusions and Summaries. 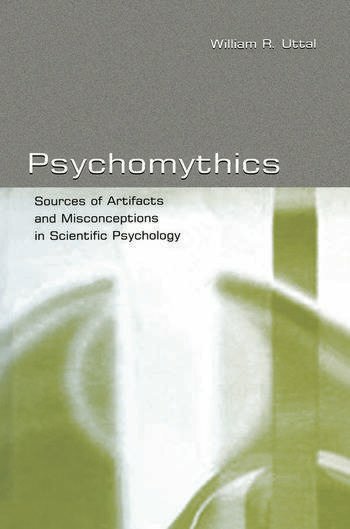 "Uttal raises very important questions and considers issues that are important if we are to avoid or eliminate the myths that plague psychology. Uttal accurately characterizes his book as 'iconoclastic'. And it is densely packed, with critical issues and questions being raised or discussed on every page." "...Uttal suggests that to explain behavior one cannot not posit entities in the head until one has exhausted regularities in the information available to the head. Although some of the material is intrinsically complex, Uttal writes clearly." "...Uttal has written an important book that deserves to be read. He raises many interesting questions and identifies in a transparent manner a host of possible methodological and conceptual pitfalls of psychological research, of which any cognitive scientist should be aware. It invites researchers to be ever critical on one's background assumptions and choice of research methods."